Getting beaten by an 11-year-old while he flings racial and homophobic taunts is annoying enough. 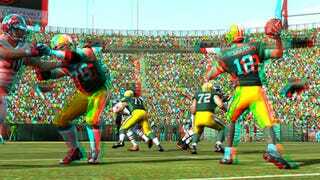 Now there's a faster way to get a headache from playing Madden 11: 3D! After somehow managing to keep it a secret this long, EA Sports announced today that with a code found in packages of Doritos, gamers can unlock "3D Mode" in Madden 11. No special TV needed, just those red-and-blue glasses that we've used since the '50s. 3D is probably coming to gaming a lot faster than it will regular television, so this is a welcome step for one of the biggest titles out there. But it's not as if Madden was designed for this. Players may pop, but the game won't go out of its way to highlight any of the potential effects, and we likely won't get a proportionate depth of field. If the dark, washed out picture of the post-production 3D converted movies is any indication, 3D only works if it's part of the project from the beginning. So the only likely application for Madden in 3D is to play against a friend at home, turn on the red-blue blur, and pop on your glasses while your opponent can't figure out where the ball is.